In this day and age, consumers expect every digital experience to be individually relevant because personalized experiences are everywhere. Amazon, Netflix, Google and others have driven up consumer expectations for personally relevant content from brands on a regular basis. But are marketers delivering on these expectations? And if not, what’s at stake for their content marketing programs? We reviewed all the latest research on the topic to nail down the real risks and rewards for content marketing teams. And the findings suggest personalization is no longer just a strategy for content marketers—it’s an imperative. 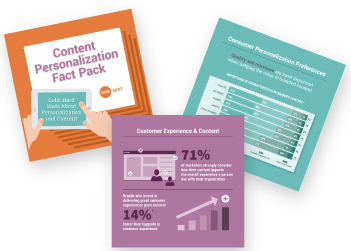 Download our latest Fact Pack to get free access to all the latest stats on content marketing personalization in 2017.